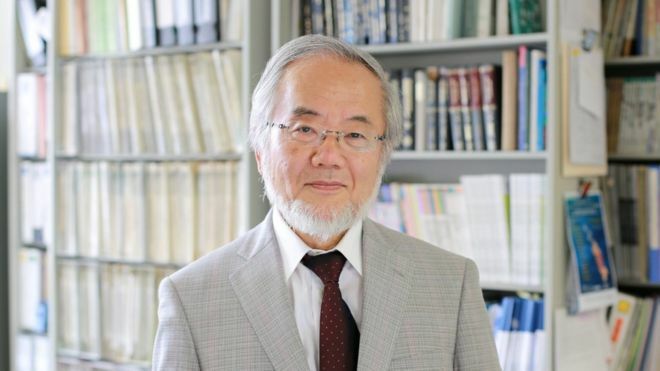 The 2016 Nobel Prize in physiology or medicine goes to Yoshinori Ohsumi of Japan for discoveries about the secrets of how cells can remain healthy by recycling waste. He located genes that regulate the cellular "self eating" process known as autophagy. Dr Ohsumi's work is important because it helps explain what goes wrong in a range of illnesses, from cancer to Parkinson's. The concept of autophagy has been known for over 50 years, but it wasn't until Dr Ohsumi began studying and experimenting with baker's yeast in the 80s and 90s that the breakthrough in understanding was made. Dr Ohsumi is reported to be surprised about receiving his Nobel Prize, but "extremely honoured". Speaking with the Japanese broadcaster NHK he said that the human body "is always repeating the auto-decomposition process, or cannibalism, and there is a fine balance between formation and decomposition. That's what life is about." Prof David Rubinsztein, an expert in autophagy at the University of Cambridge, said he was delighted that Dr Ohsumi's vital work had been recognised and rewarded. "His pioneering work in yeast led to the discovery of the key genes and fundamental biochemical processes that are required for autophagy. "As autophagy is well conserved from yeast to man, his laboratory's discoveries have also provided the critical tools to many labs to enable the appreciation of the important roles of autophagy in diverse physiological and disease processes. "These include infectious diseases, cancers, and various neurodegenerative diseases such as Huntington's disease and forms of Parkinson's disease. Indeed, autophagy manipulation may provide a key strategy for treating some of these conditions." More than 270 scientists were nominated for the prize, which was awarded at Sweden's Karolinska Institute and comes with eight million Swedish kronor (around £728,000 or$936,000 or 834,000 euros) for the winner. 2015 - Three scientists - William C Campbell, Satoshi Ōmura and Youyou Tu - for anti-parasite drug discoveries. 2014 - Three scientists - John O'Keefe, May-Britt Moser and Edvard Moser - for discovering the brain's navigating system.